The honour roll commemorates past students who served in World War One. It lists 54 names. 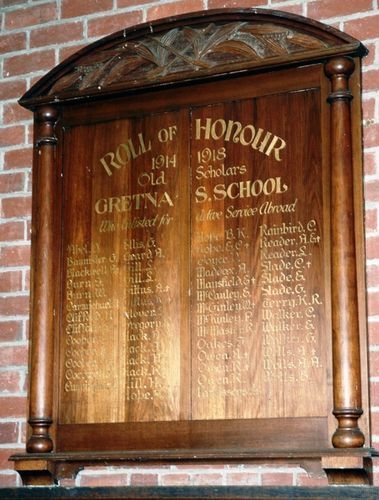 The record of the patriotism of the old boys of the Gretna school, as disclosed at the unveiling of its honour roll yesterday afternoon, should probably be found to be unexcelled in the State. No fewer than 54 former scholars joined the colours, and of those 16 made the supreme sacrifice. The unveiling ceremony was performed by the Warden of New Norfolk (Mr J L. Nicholson). The Mercury (Hobart), 26th November 1921. Note : The hall was sold on January 9 2019 to a person who has plans to convert the hall into a home. It is unknown when this will occur and what will happen to this honour roll.